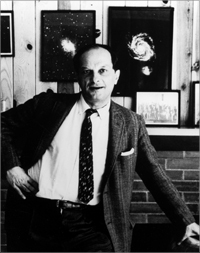 Stanislaw Ulam was Professor of Mathematics at University of Colorado, Boulder (1965-1977). Other institutional affiliations included Los Alamos Laboratory. His research interests included set theory, topology, ergodic theory, probability, cellular automata theory, the study of nonlinear processes, the function of real variables, mathematical logic, number theory, the Monte Carlo method, hydrodynamics, and nuclear propulsion. April 3, 1909Birth, Lviv (Ukraine). 1932Obtained MA, Polytechnic Institute of Poland (Lʹvivsʹkyĭ politekhnichnyĭ instytut), Lviv (Ukraine). 1933Obtained DSc, Polytechnic Institute of Poland (Lʹvivsʹkyĭ politekhnichnyĭ instytut), Lviv (Ukraine). 1936Member, Institute for Advanced Study. 1936 – 1940Junior Fellow, Society of Fellows (1936-1939) and Lecturer (1939-1940), Harvard University. 1940 – 1943Instructor (1940-1941) and Assistant Professor (1941-1943), University of Wisconsin, Madison. 1943 – 1967Researcher (1943-1957) and Research Advisor (1957-1967), Los Alamos Laboratory, Los Alamos (N.M.). 1945 – 1946Associate Professor, University of Southern California. 1951 – 1952Visiting Lecturer, Harvard University. 1956 – 1957Visiting Professor, Massachusetts Institute of Technology (MIT). 1961 – 1962Visiting Professor, University of Colorado, Boulder. 1963Visiting Professor, University of California, San Diego. 1965 – 1977Professor of Mathematics (1965-1977) and Professor of Biomathematics, Medical School (1968-1975), University of Colorado, Boulder, Boulder (Colo.). 1966Member, National Academy of Sciences. 1974 – 1984Graduate Research Professor, University of Florida. 1979 – 1984Visiting Professor of Biomathematics, Medical School, University of Colorado, Boulder. 1980 – 1984Visiting Professor, Neurosciences Institute, Rockefeller University. 1982 – 1983Visiting Professor, University of California, Davis. May 13, 1984Death, Santa Fe (N.M.). Both employed at Harvard University. Collaborated on the Teller-Ulam design for thermonuclear weapons which led to the development of the hydrogen bomb. Both employed at Los Alamos Laboratory, Manhattan Project. Junior Fellow; Lecturer; and Visiting Lecturer. Visiting Professor and Professor of Biomathematics. Professor of Mathematics and Visiting Professor. Obtained MS (1932) and DSc (1933). Los Alamos Science special issue on Stanislaw Ulam, 1987. John Von Neumann papers, 1912-1996 (bulk 1935-1957). Oral history interview with John A. O'Keefe, 1993 February 2. Oral history interview with John G. Kemeny, 1984 June 7. Oral history interview with Richard Garwin, 2012 December 20. Oral history interview with Ted Taylor, 1995 February 13. Adventures of a mathematician / S. M. Ulam. My world line; an informal autobiography. Foreword by Stanislaw M. Ulam. From cardinals to chaos : reflections on the life and legacy of Stanislaw Ulam / editor Necia Grant Cooper ; associate editors, Roger Eckhardt, Nancy Shera. From Paris to Santa Fe: highlights of a personal odyssey across the twentieth century.